I've been to many physical therapists & Chiropractors over the years. The Doctors & employees here have helped me beyond my greatest expectations. The service, friendliness of the staff, expertise of the doctors is the best in Tulsa (in my opinion). Dr. Riley & Dr. Radloff have done wonders for me. I am so thankful. Very professional with amazing staff! Dr. Orileys staff is out of this world. I was Truly impressed with everyone from the front desk girls like Courtney, to their massuses, ryan & derrek and ofcourse Oriley himself. Would recommend to everyone i know! The best people and service and everything! I was in desperate need of help and these people came to my rescue! They can fix anything. Thank you so much Ryan and Sean. 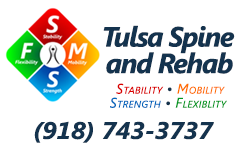 Thanks to Ryan and staff at Tulsa Spine and Rehab i was ahead of the game getting my knee in shape after surgery and looking forward to a trek into the mountain forest in Uganda in July to observe the gorillas! Everyone was professional and friendly and my twice a week sessions were enjoyable. My knee and supporting muscles showed improvement with each visit! Thanks! Ryan smith, is an outstanding Physical Therapist! After having shoulder surgery, I was prescribed about 5 months of PT. They have an excellent team and they truly care about their patients. They are always kind, respectful, encouraging and patient. Thanks so much for helping with my recovery! They are truly the best in Tulsa! I will always choose them for my care. After recovering from a fractured tibia, I received physical therapy from Ryan Smith. With his treatment I have fully recovered. The positive atmosphere at the clinic made it a pleasure to go twice a week. With the direction & encouragement from Ryan, assistant physical therapist Megan, & techs Amanda & Will I have regained a normal gait & my stamina. I couldn’t have recovered as quickly or completely without their care. The front desk staff were all very friendly, caring & helpful. 1st class service and unbelievable results. Never felt so strong.